The purpose of this article is to show in a step by step manner how to use and connect C# with MySql using MySql Connect/NET. I will create simple examples about the DML (Insert, Update, Select, Delete) throughout the article to show how to query the database using C#, and in the end I will show you how to backup your database and save it in a.sql file from our application, and how to restore it back. First make sure you have downloaded and installed the MySQL Connector/NET from the MySQL official website. 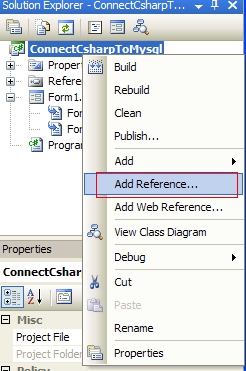 In this article, I will use the Connector/NET version 6.1. Now let's create the database, and the table that we are going to query from our application later on. It's always a better idea to create a new class for connecting to the database and to separate the actual code from the code that will access the database. This will help keep our code neat, easier to read and more efficient. connection: will be used to open a connection to the database. server: indicates where our server is hosted, in our case, it's localhost. database: is the name of the database we will use, in our case it's the database we already created earlier which is connectcsharptomysql. uid: is our MySQL username. password: is our MySQL password. connectionString: contains the connection string to connect to the database, and will be assigned to the connection variable. We should always open a connection before querying our table(s), and close it right after we're done, to release the resources and indicate that this connection is no longer needed. Opening and closing a connection to the database is very simple, however, it's always better to use exception handling before opening a connection or closing it, to catch the errors and deal with them. //0: Cannot connect to server. //1045: Invalid user name and/or password. Usually, Insert, update and delete are used to write or change data in the database, while Select is used to read data. For this reason, we have different types of methods to execute those queries. 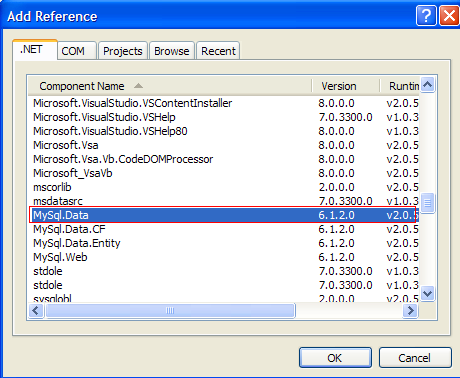 ExecuteNonQuery: Used to execute a command that will not return any data, for example Insert, updateor delete. ExecuteReader: Used to execute a command that will return 0 or more records, for example Select. ExecuteScalar: Used to execute a command that will return only 1 value, for example Select Count(*). Open connection to the database. Assign a connection and a query to the command. This can be done using the constructor, or using theConnection and the CommandText methods in theMySqlCommand class. To execute a Select statement, we add a few more steps, and we use the ExecuteReader method that will return adataReader object to read and store the data or records. Create a MySqlDataReader object to read the selected records/data. Read the records and display them or store them in a list. Sometimes, a command will always return only one value, like for example if we want to count the number of records, we have been using Select Count(*) from tableinfo;, in this case, we will have to use the method ExecuteScalarthat will return one value. Parse the result if necessary. Before I show you how to backup the database from our application, I will explain a little bit about processes, commands, arguments and the input and output. mysqldump -u username -p password -h localhost ConnectCsharpToMysql > "C:\Backup.sql"
mysql -u username -p password -h localhost ConnectCsharpToMysql < "C:\Backup.sql"
mysql and mysqldump are the filename or the executable file. -u username -p password -h localhost are thearguments. > "C:\Backup.sql" is where the output is directed. < "C:\Backup.sql" is where the input is directed. Now that we know how the command is divided, we can start implementing it in our application. ProcessStartInfo is used in conjunction with Process, to setup the process before it starts. To write our output to a file or read our input, we can use theRedirectStandardInput and RedirectStandardOutputproperties in the ProcessStartInfo component to cause the process to get input from or return output to a file or other device. If we use the StandardInput orStandardOutput properties on the Process component, we must first set the corresponding value on theProcessStartInfo property. Otherwise, the system throws an exception when we read or write to the stream. Now back to our application, to backup the database, we will have to set the RedirectStandardOutput to true, and read the output from the process into a string and save it to a file. To restore the database, we read the .sql file and store it in astring, then set the RedirectStandardInput property totrue, and write the input from the string to the process. In this article, I demonstrated how to connect C# to MySQL and query the tables using simple examples for the insert,update, delete and select statements. Also, and because it's not widely available over the internet, I decided to demonstrate how to backup and restore a MySQL database from the C# application.